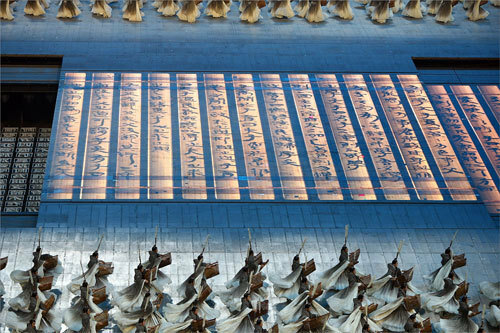 Performances at the opening ceremony opened with a well-known saying of Confucius, "Friends have come from afar, how happy we are." And 2,008 performers beat the ancient Chinese percussion instrument, the Fous, and sang to welcome friends from all over the world. 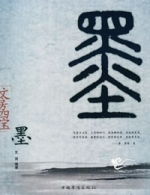 Some of the much quoted lines from his Lunyu, or the Analects, were chanted during the performances, including "All those within the four seas can be considered as brothers." Confucius (551 BC-479 BC) was a famous educator and thinker in ancient times. He was also founder of Confucianism, a mainstream school of thought that deeply influenced later generations. These were a kind of books with scripts carved on the stringed bamboo slices, an ancient book form. 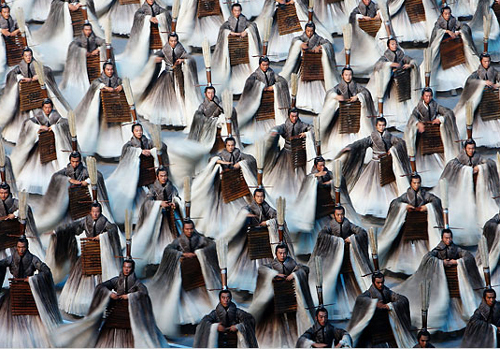 "Disciples" of Confucius held bamboo slips during the performances. 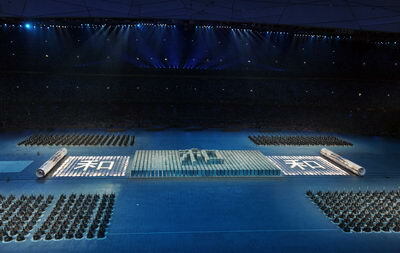 Ancient Chinese characters of "He", meaning harmony, appeared several times during the "writing" part of the performances. It echoes Confucius idea of humanism, meaning "Harmony is precious". To create Chinese characters one needs a brush, paper, ink stick and ink stone. These items are colloquially known as the "Four Treasures of Study". To learn the art of calligraphy, it is necessary first to get acquainted with these tools. 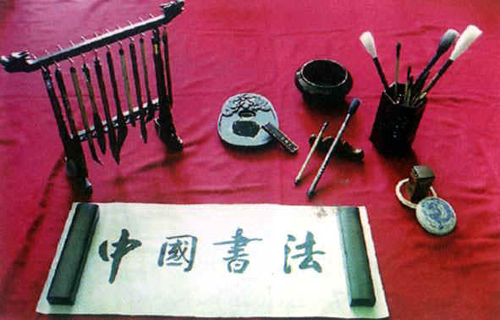 Among the various calligraphy tools, the writing brush is unique to China. The brushes are varied and consist of three major types: white goat's hair, black rabbit's hair and yellow weasel's hair. The brush tip signifies its function. Tips are classified into three groups: "Hard", "Soft" and "Both". Brush handles may consist of bamboo, wood, lacquer and porcelain, but valuable ones may be made with precious materials, including mother-of-pearl inlay, ivory and jade. The writing brush has a very long history. Prehistoric painted pottery, inscriptions on oracle bones, bamboo slips and silks have all been used as writing materials for brushes. Some ancient writing brushes have also been excavated from gravesites dating back to various periods: the Spring and Autumn Periods, the Warring States Period, the Qin and the Han Dynasties. 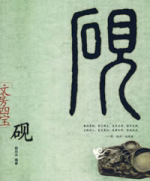 During the Tang and Song Dynasties, Xuanzhou became the national writing-brush-producing center. Products there were called "Xuan-bi", and "Zhuge-bi" – at that time the Xuanzhou brushes were of the very best quality. After the Yuan Dynasty the brush-producing industry in Huzhou boomed, and "Hu-bi" brushes replaced "Xuan-bi" in quality. The brush characteristics of "Hu-bi" can be described as sharp, neat, round and tough. The ink-stick is a unique pigment used in Chinese traditional painting and calligraphy. During the initial stage natural ink or half-natural ink was generally used. The most famous ink stick is hui mo (Anhui ink stick). It is still made of pines that grow on Huangshan Mountain in Anhui Province. Clean water is needed to grind the ink stick, which must be balanced in the hand during the grinding or rubbing process. Press hard and rub lightly, slowly and evenly against the ink slab until thick, liquid-ink forms. It was during the Han dynasty that artificial ink appeared. At that time the most famous ink-stick was "Yumi-mo". It was produced in Qianyang, in Shaanxi Province. The raw materials of this ink-stick consisted of pine, oil and lacquer. Prior to the Five Dynasties period the ink-producing center was located in North China. Gradually it moved to South China. The most celebrated South ink-stick was called "Hui-mo"; it was produced in Huizhou, in Anhui Province. Paper is one of four celebrated Chinese inventions. Most people acknowledge Cai Lun as the inventor of paper during the Eastern Han period. After the Eastern Jin Dynasty, paper was extensively used instead of other traditional writing materials, such as bamboo slips and silks. Various methods of producing paper emerged rapidly. During the Tang and Song Dynasties, the paper producing industry boomed. Celebrated products of the best quality appeared one after another. During the Qing dynasty "Xuan-zhi" paper produced in the Jing Prefecture of Anhui (Xuanzhou) Province became the renowned material used for painting and calligraphy. This substance was regarded as the "the king of the paper"; it was soft and finely textured, suitable for conveying artistic expression - both Chinese calligraphy and painting. The stuff had good tensile strength and was mothproof; hence it could be preserved for a long time. The inkstone is the most important of the "four treasures of the study". Moreover, because of its solid texture an inkstone can be handed down through the ages. Ink stones or ink slabs are classified into three categories: “Duan”, “She” and “Tao”. Features common to all three ink slabs are the stone's hardness and fineness. Although the stone is hard and fine, it is not dry or slippery. Using a hard, smooth stone, liquid ink can be produced easily by rubbing the ink stick against the stone. By controlling the flexibility of the brush, the concentration of the ink and the absorbency of the paper, an artist could produce an infinite variety of calligraphic styles and forms. Ancient calligraphy tools included not only brush, ink-stick, paper and inkstone, but also some accessories, such as penholders, brush pots, ink boxes, paperweights, seals and seal boxes. The raw materials of these tools consisted of pottery, porcelain, copper, iron, lacquer, wood, bamboo, stone, jade, jadeite, agate and even coral.